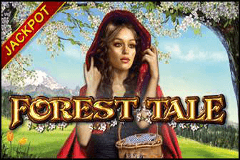 The classic story of Little Red Riding Hood comes to the reels of EGT’s Forest Tale video pokie. Set out across 5 reels, there’s Grandma, the Huntsman, a Big, Bad Wolf and Riding Hood herself, who is no longer little and is portrayed as a beautiful woman in this well-designed game. Along with standard winning combinations of matching symbols across a payline on adjacent reels, we also have a basket full of bonuses, such as wild multipliers and a free spins round. All EGT pokies come with the option to gamble winnings as well as the Jackpot Cards progressive game that’s linked to the 4 playing card suits displayed above the reels. A total of 15 paylines run from the left side of Forest Tale, and players can choose to activate 1, 5, 7, 10 or all 15, although any winning combinations that land on an inactive line won’t count, so most punters will play them all, which means a low limit stake of just 0.15 per spin. If that’s still too much, free Forest Tale video pokies can be practiced at many casinos, and then they can play for real money once happy with how it all works. There’s a nice image of a forest clearing behind the reels, and all symbols look very realistic, although the standard playing card icons J, Q, K and A will tend to fill much of the game, as these pay out the smaller and subsequently more common wins. Landing 3, 4 or 5 of a kind pays out 5, 20 or 100 coins, and the next most valuable symbols are the wolf and a wishing well, each of which is valued at 10, 50 or 200. Grandma returns wins of 2 coins when she turns up on reels 1 and 2, while seeing this friendly white-haired old lady across all 5 reels on an active line is worth a prize of 500, which is the same as the Huntsman. The best wins are reserved for players who land Little Red Riding Hood across the reels, as she will deliver between 10 and 5000 coins when landing across an active line. She’s also a wild symbol, able to act as any other if it’s then possible to complete a winning line, either filling in any gaps in a sequence, adding to a winline by extending it across extra reels, or both at once. She’s not only kind to Grandma, but also kind to players, doubling the base value of a win when she completes a line. Our heroine can’t substitute for the picture of Grandma’s house in the woods however, as this is a scatter symbol that isn’t worth anything on its own, but any time 3 or more appear in any positions, it takes players to a free spins bonus round. Before they begin, players are shown 12 baskets and by clicking on them in any order they unveil extra spins and multiplier values that will apply to any wins throughout them. They start with a guaranteed 7 spins and a 1x multiplier, but the perfect selection sees 20 spins play out and a 5x multiplier in effect. The spins can be retriggered, and any new ones are added to the end of the round currently playing out. There’s a unique Scatter Game on top of this, which is basically the same process of picking baskets, but results in cash prizes or entry to the Forest House free spins round. Any win of 525 coins or less can potentially be multiplied several times over in the optional gamble round. Correctly timing a click on a red or black button as a playing card flashes between the colours will double it, but a wrong pick loses the gamble and the triggering bet is removed. Once the random Jackpot Cards round starts up, players are guaranteed to win any of the Club, Heart, Diamond or Spade progressive prizes shown above the reels, although which one depends on which suit is first found 3 times from 12 face-down playing cards that are lined up before them. An attractive design isn’t all that this pokie has to offer, as the features can be quite rewarding as well. Like all EGT games, there’s a decent return to player ratio and it’s independently certified for fair play, although the only real downside to the game is that it isn’t mobile-optimised. But for those players at desktop online casinos that carry this game, there’s some fun gameplay, particularly the rounds where baskets are picked and instant payouts, free spins and multipliers are awarded. ‘’Grandma, what rewarding bonus features you have.’’, said Riding Hood when she saw this game. Maybe.